Are Chelsea trying to sign Joe Hart? News is circulating that Chelsea are interested in signing Joe Hart, once his loan at Torino expires at the end of the season. A whole host of newspapers, including The Independent, The Sun and The Express, are reporting that Chelsea boss, Antonio Conte, watched Hart play in Torino’s 2-1 victory over Fiorentina on Sunday. Chelsea’s current number one, Thibaut Courtois, has followed up on his disappointing form last season with a poor start to this year’s campaign, and it seems as though Conte has lost faith in the Belgian stopper. Real Madrid are said to be keen on securing Courtois’ signature if he does indeed decide to leave West London. Hart, meanwhile, has adjusted to life in Italy very well, quickly becoming a fan favourite after a string of excellent performances, including back-to-back clean sheets in Serie A last month. It is unlikely that City would stand in his way if he decided to join a Premier League rival, with the club’s hierarchy said to be understanding of his situation and also aware of his fantastic contribution to the recent successes of the club. 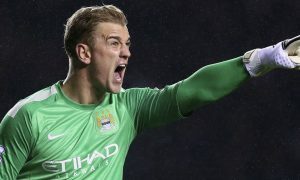 For now, Hart remains focused on continuing his great start in Turin, with another seven months to go until his loan deal expires.